Roman centurion Marcian (Jeff Chandler) is captured by Attila the Hun (Jack Palance) en route to Constantinople, but escapes. 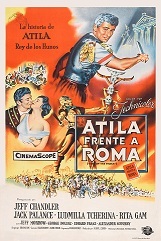 On arrival, he finds the eastern Roman emperor Theodosius (George Dolenz) plotting with Attila to look the other way while Attila marches against Rome. But Marcian gains the favor of Pulcheria (Ludmilla Tch�rina), lovely sister of Theodosius, who favors a united empire. As Attila marches, things look bleak for the weakened imperial forces. But the conqueror has an awe of the power of the Christians' God. Also with Rita Gam, Allison Hayes and Michael Ansara. This film came from an uncut, widescreen German import of very nice picture quality. Jeff Chandler died on June 17, 1961, at age 42, from blood poisoning after an operation for a slipped disc.